Preheat the oven to 220˚C (425˚F). Put the potato on a wooden spoon, flat side down. Start from one end of the potato, slice down, at about 3 to 4 mm intervals. Pound all the rosemary, garlic, and sea salt in a pestle mortar until you have a coarse paste. Rub all the sliced potatoes with the aromatic mixture. Make sure to insert some aromatic mixture in between the slits. Scatter some butter on top of each potato. 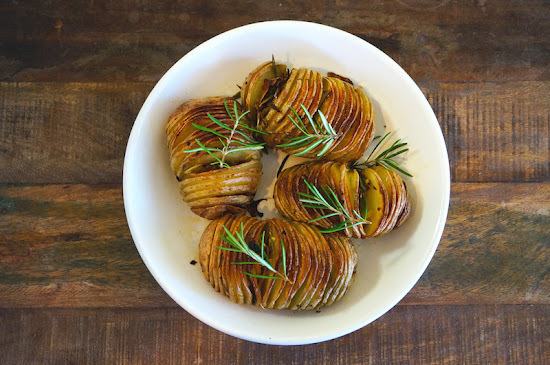 Bake the potatoes for about 40 to 50 minutes or until the potatoes turn crispy and the flesh is soft.